Debuting in 2016, the Native Birds of Germany Series of Gold Euros is immensely popular with collectors. These intricately detailed coins are sought after for their beautiful designs based on the birds that live in Germany's forests and woodlands. A millesimal fineness of 99.99% ensures that Native Birds of Germany Gold Coins are also a smart buy for investors. 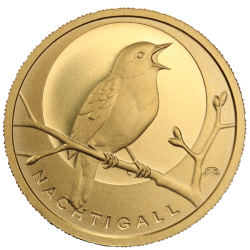 The six-part coin collection began with the Nightingale in 2016 and was followed by the Golden Oriole (Pirol) in 2017. Subsequent coins will feature the Owl (2018),Peregrine Falcon (2019),White Stork (2020) and Black Woodpecker (2021). Strictly limited to just 40,000 each, Native Birds coins are produced equally by all five of the country's leading mints.